Oro applications support out of the box integration with Zendesk, enabling you to load data from your Zendesk account and process it in the Oro application. This article describes how to define and edit the integration and synchronization settings. While Zendesk integration capabilities are pre-implemented, OroCRM and OroCommerce can be integrated with different third-party systems. Click Create Integration on the top right. Default Zendesk User Email User with this email will be assigned tickets that come from the Oro application and for which there are no Zendesk users with a matching email address. In the Synchronization Settings section, enable/disable the two-way synchronization. Select the Enable Two Way Sync check box, if you want to download data both from Zendesk to your Oro application and back. If the box is left unselected, data from Zendesk is loaded into the Oro application, but changes performed within it are not loaded back into Zendesk. Remote wins — Zendesk data is applied to both Zendesk and the Oro application. Local wins — Oro application data is applied to both Zendesk and Oro the application. As an illustration, we have created a sample Zendesk integration with two-way synchronization enabled and sync priority set to Remote Wins. This means that if the same data is changed from both Zendesk and OroCRM, Zendesk changes take precedence. Initially the integration is inactive. In order to activate it, click Activate on the integration details page. To delete or edit integration details, navigate to the the page with all integrations System > Integrations > Manage Integrations. Once integration has been created, the data is automatically synchronized. 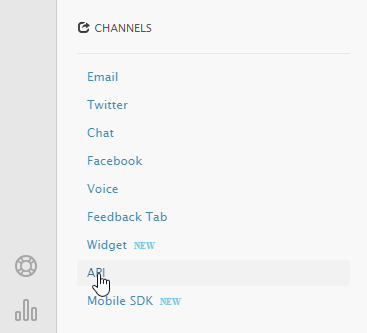 Navigate to System > Integrations > Manage Integrations in the main menu. For the the integraion with Zendesk, hover over the More Options menu to the right and click to schedule sync. Alternatively, open the integration details page and click Schedule Sync on the top right. Wait for data to synchronize. Click the Check progress link to see the synchronization status. For each case created as a result of synchronization with Zendesk, a ticket is created in the Oro application. 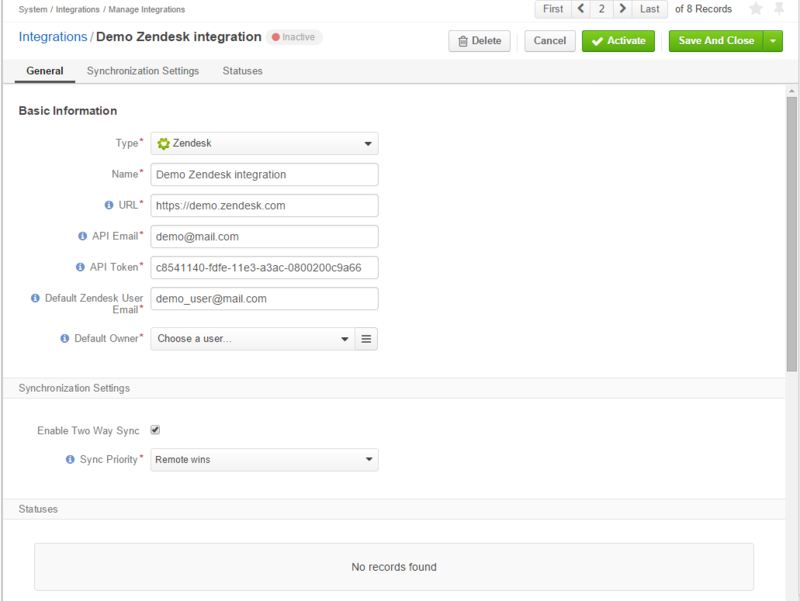 If two-way synchronization is enabled, the Publish to Zendesk button is available on the Case details page. Click the button to submit the case to Zendesk. If some ticket details of a Zendesk ticket have been changed after the initial synchronization, the corresponding Oro application case details will also be updated in the course of the nearest synchronization. If some ticket details of an Oro application case have been changed after the initial synchronization, the corresponding Zendesk ticket details will also be updated automatically (if the two-way synchronization is enabled). If the same details have been updated in a related Zendesk ticket and Oro application case, and the two-way synchronization is enabled, the synchronization priority settings will be applied.